If you don’t already know how much you’re spending on food each month you really should take the time to figure it out. Those who don’t know how much they’re spending on food (this includes eating out for lunch and your occasional Starbucks run) are 20 times more likely to be in debt. Think about it, let’s say you eat out for lunch during the week and it costs $7.00 a day – that’s $140 a month! Add your daily Starbucks to that and you end up spending a whopping $260 monthly – and that’s before you’ve factored in your groceries! Sure, it would be most convenient to make a one-stop-shop but you will certainly pay for it. Find out which stores have the best price for the things you typically purchase. Places like Costco have extraordinary prices for meat and bulk items. Items you tend to use a lot of try to buy in bulk. For instance, if you buy a large package of meat, take it home and divide it into realistic proportions and put those proportions in freezer bags so they are ready for you to take out and defrost for dinner. Don’t Buy what You don’t Need! We all need to eat but do you really need all of those things you are buying – probably not. You made your grocery list of things you need for your meals so stick to it and don’t buy all of those unhealthy snacks and soda if you can help it. It may sound silly to clip coupons but according to “Consumer Reports”, coupons helped Americans save $30 billion dollars just last year. 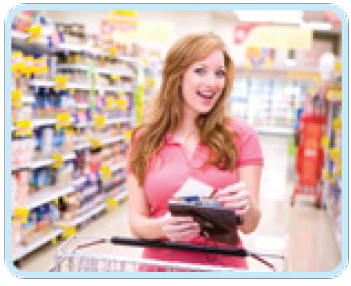 Coupons can be found in various places like your newspaper, at the front of the store or on the internet. Here are some good coupon websites: coolsavings.com, coupons.com, startsampling.com. Please keep in mind, they may ask for your name and email address which could mean daily SPAM and they could also be selling your information to marketing companies. You don’t have to give your actual information, simply create a free Yahoo email account to provide. 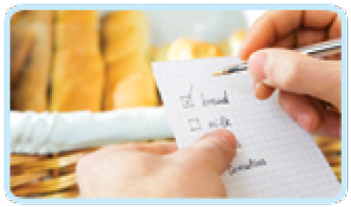 Create a Grocery List & Stick to it! Before going to the store, create a grocery list. Doing this will help you avoid those impulse buys. To make your list, think about what you will be making for dinner for the next 2-weeks and take a look in your cupboards and fridge to see exactly what you will need to make those meals. Don’t forget to factor in your lunch too! There’s no need to eat fast food – it’s far too costly and bad for your health. Prepackaged foods or frozen foods are not only high in price but are normally high in fat. However, frozen vegetables are not such a bad idea as they are healthy for you, low in cost and they have a long life versus fresh vegetables. As for the rest, try to avoid it. Although it is best to make your meals for a variety of reasons, if you think purchasing a pre-made lasagna will keep you from eating out then maybe purchase 1 or 2 dinners if need be. Also, frozen pizza is oftentimes less than a third of the price of going out for pizza. You may be saying – where did my money go, I just got paid? If you eat out chances are that’s your answer. Having trouble cooking or running out of ideas? Simply check the internet for recipes and ideas. Visit foodnetwork. com for a large variety of recipes or allrecipes.com if you’d prefer a more simple approach. Leftovers can save you money and time. If you have leftover meatloaf or roast, make homemade deli sandwiches the next day. Leftover ground beef from tacos can be put into sauce and made into Spaghetti. Leftover chicken can be made into a stir-fry the following day – the possibilities are endless. Get creative with your leftovers; you’d be surprised what you can do with them.